For my card, I went with a color that I never seem to use a lot of, Perfect Plum. Yes, this card also marks the return of the infamous Button Buddies stamp set. Surprise! Looks like I'm back on the kick again...this is truly my most used stamp set from the new SU! catalog, I tell ya. I thought the "You're a Gem" sentiment, from the stamp set of the same name, fit perfectly for this pretty purple thank you card. I added one more button to the bow, for fun. This is just gorgeous. I love those four panels behind the main image. Great monochromatic card! Love this. The layers are fabulous. Lots of interesting eye candy! Beautiful!! I like the Perfect Plum but very seldom use it! LOVE this card. This is gorgeous! Love the layout, layers and bling! Great details and such pretty color! Love it! 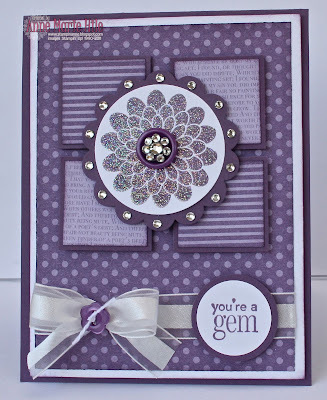 I never use Perfect Plum not sure why, always thought it was too dark, but your card is gorgeous! Lovin' the blinged out button :) Give the fur babies some belly rubs from Lucky and I.
Anne Marie, your card looks perfect. I like the different layers and your layout. And i LOVE purple. Gorgeous, Anne Marie! The flower with its bling is stunning, and so appropriate for the sentiment! 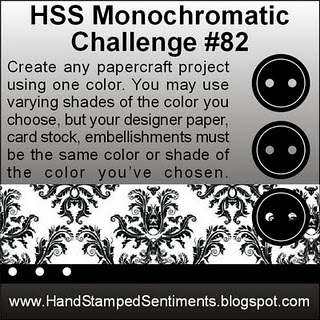 I have to say, when I saw monochromatic, I was expecting pink (wonder why??) But your plum card is soo pretty! When I first started stamping that was one of my favorite colors (especially w/ sage)but haven't used it recently either. Wonderful job on the card challenge!! What a beauty!!!! Love all the purple!!! Wow - your bow is OUTSTANDING!!!!!! Off to see what else I missed through the outage! 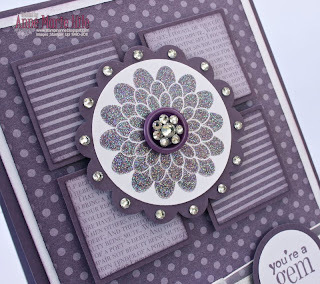 Ann Marie I just LOVE this "perfect" plum card. the bling is spectacular!.... and added button bling is way cool! 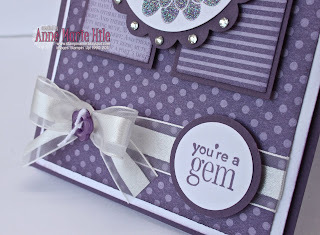 Very pretty Perfect Plum card! Button Buddies seems to be your go- to stamp set. I love the Iridescent Ice embossing powder it coordinates so well with the gemstones on your button. Beautiful!